Last spring I started a new series of classes called "Inspired Cooking by the Book." The idea for this series came about because a small portion of my rather large cookbook collection is made up of books that are organized by the seasons. Since I truly do cook seasonally, this particular portion of my collection is a constant source of inspiration in my kitchen. I thought it would be fun to share recipes sourced from these books in a series of (at least) four classes. The third class in the series (Autumn) is this week and will feature—among other things—the yellow split pea soup I posted at the end of September as well as a fantastic salad of pears with endive, arugula, hazelnuts and blue cheese...which I'm sharing today. Both the soup and the salad are unusual in that I have not changed the recipes in any marked way from the originals. I don't very often leave recipes unchanged, and it is testimony to how much I love these books—and respect the authors—that I don't need or want to alter some of the recipes. It is true that an equal balance of the recipes in these classes bear only a passing resemblance to the "inspiring" recipe...but that is more a reflection of my preference or mood—and the fact that often a recipe is nothing more than a single point of inspiration—than the quality of the original. 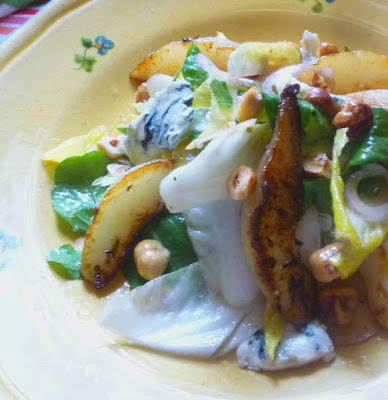 The pear salad is from Suzanne Goin's first book Sunday Suppers at Lucques. I turn to this cookbook all the time. I particularly love Goin's salads... Generally layered affairs of big pieces of cooked and/or raw fruits and vegetables, nuts, cheeses, dried fruits and interesting greens...they are exactly what I want in a salad: a knife and fork worthy platter of interesting flavors and contrasting tastes and textures. Of particular note in the pear salad is the St. Agur cheese. From the Auvergne of France, it is a double cream cow's milk blue that is firm, yet decadently creamy and spreadable...some say buttery. It is tangy and salty...but mildly so. 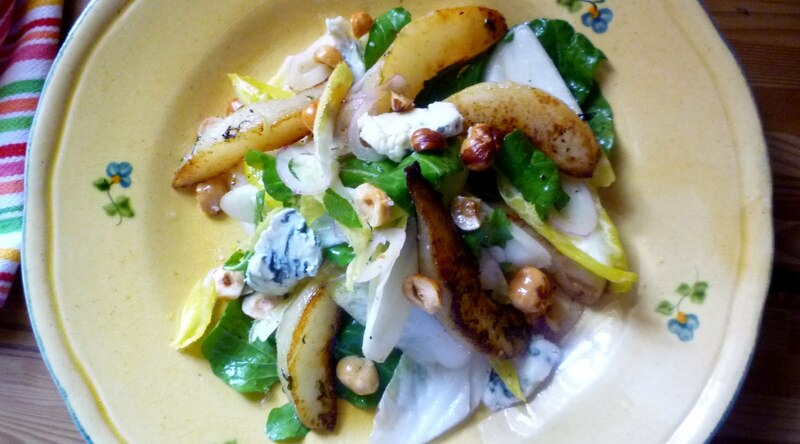 It provides wonderful compliment and contrast for the soft, sweet pears, the crunchy and rich hazelnuts, and the crisp and slightly bitter endive. If you can find it, you should try it. If not, Goin recommends a Gorgonzola Dolce or a creamy sheep's milk cheese of some kind instead. Now would be a great time to try this salad: Pear season is in full swing. But pears are available and delicious for most of the fall and winter months, so if this salad seems like too much work (sautéing the pears might seem like a bit of a project if you don't have a very large sauté pan) for an everyday dinner, it would also make an impressive salad course for a holiday dinner party. Spread the hazelnuts on a rimmed baking sheet and toast in a 350° oven until the skins begin to split and the nuts (as visible beneath the skin) are golden and fragrant—10 to 15 minutes. Wrap the nuts in a kitchen towel and set aside for a few minutes. Rub the nuts in the towel to remove the skins. If the skinned nuts aren't as well toasted as you would like, briefly return them to the oven. Toss the warm, hazelnuts with a drizzle (1 t.) of olive oil and a pinch of salt. When cool, chop coarsely and set aside. Place the vinegars, diced shallots and 3/4 t. kosher salt in a tall narrow container (that will accommodate an immersion blender) and set aside. Heat a large sauté pan (see note) over high heat add enough olive oil to lightly coat the surface and add as many pears as will fit in a snug single layer cut side down. Add some butter to the pan—enough so that the pears look moist and sizzle nicely in the browning butter—along with some of the thyme and a good pinch of salt. Reduce the heat to medium high and cook till nicely caramelized on the first side—4 to 6 minutes. Carefully turn the pears over and caramelize the second cut surface—another 3 or 4 minutes. Regulate the heat as necessary to keep the pears from burning. When the pears are finished cooking, prepare the vinaigrette. Add 6 of the cooked pear wedges to the container with the vinegar and shallots and purée using and immersion blender (see note). With the blender running, add 3/4 cup of olive oil in a thin stream. Taste and correct the seasoning with salt and the balance with vinegar. To serve: Place the endive, arugula and shallots in a large bowl and season with salt and pepper. Drizzle in enough of the vinaigrette to lightly coat the greens. Drizzle some of the vinaigrette over the warm pears. The original recipe called for cooking the pears simultaneously in 2 large sauté pans. This is impractical for most home cooks. I have given directions for working in batches. Use your largest sauté pan and add only as many pears as can be accommodated in a snug single layer. To sauté five pears you will need about 2 T. of oil, 2 t. of thyme and 2 to 4 T. of butter in total. Divide these items in equal increments to match the number of batches of pears (so, if you only need to make two batches of pears you will use about 1 T. of oil, 1 t. of thyme and 1 to 2 T. of butter per batch). If you don't have an immersion blender, place the shallots in a bowl with the vinegars and salt. Smash the cooked pears to a chunky purée with the side of a chef's knife or in a mortar and pestle. Whisk the oil into the vinegars in a thin stream. Fold in the pear purée. If you like, replace 1/4 c. of the olive oil with hazelnut oil.